Welcome to the Muzique therapy book club! To sign up for the Muzique Therapy Book Club email list and get notifications about the book of the month and other information, or if at any point you think you may want to join the book club, sign up right here! We're so excited to have you join us! To register to participate in a book club, please scroll down to the bottom of the page and fill out the “Muzique Therapy Book Club Registration Form”! Stay in the loop about the Muzique Therapy Book Club! 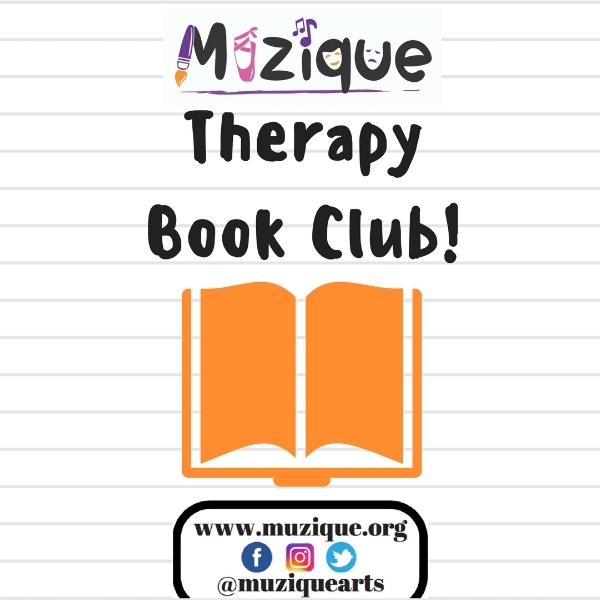 In order to view any of live video chats, all you have to do is join the Muzique Therapy Book Club Facebook group, which is free for anyone who would like to join the conversation and find out more about the Book Club! To officially sign up for the Muzique Therapy Book Club, and get those CMTE credits, please read all details below and then fill out the “Muzique Therapy Book Club Registration Form”! WE WILL DISCUSS BOOKS IN ETHICS, SELF-CARE, SPECIFIC POPULATIONS, PRIVATE PRACTICE, AND SO MUCH MORE! Schedule for the month/CMTE Breakdown: Reading the book of the month (3 credits), live video on the last Thursday of the month at 9pm to discuss the book and interactions in the Facebook group throughout the month (2 credits), worksheets for each week of reading to help you breakdown the concepts in the book (3 Credits). Live chats are encouraged to be watched live but it is NOT required that you be available to watch the live streaming while it is happening; it is simply required that you watch the video at some point. CMTE credits will be given once all worksheets, video chat and Facebook post screenshots, and course evaluation survey are completed and emailed to karly.muzalier@muzique.org by the 5th of the following month, or within 30 days of receiving the course if you are participating in a previous book club! FOR MUSIC THERAPIST: Each month in the book club, with the completion of the monthly course and course fee, you will receive 8 CMTE credits for only $50! Worksheets and screenshots must be submitted in one email at the end of every month and survey completed to receive your CMTE credits for each month. FOR ALL OTHER THERAPISTS/COUNSELORS/MUSIC THERAPISTS NOT SEEKING CREDITS: For the non-CMTE option, it is only $25 a month to be a member of the book club and have full access. Please remember that you WILL NOT receive CMTE credits, but you will have full access to the Facebook group discussions, worksheets, and all other aspects of the Muzique Therapy Book Club. STUDENTS/INTERNS: We have a student/intern membership that is $15 a month to have full access to the Facebook group discussions, worksheets, and all other aspects of the Muzique Therapy Book Club. YOU MUST SHOW PROOF OF STUDENT STATUS BY EMAILING YOUR CURRENT CLASS TRANSCRIPT TO KARLY.MUZALIER@MUZIQUE.ORG. You are responsible for purchasing, renting, or borrowing the book for each month. Books will be announced at least a month before if not sooner to give you time to get the book. We will break down the book week-to-week, so you can choose to read the book throughout the month with us, or ahead of time at your own pace. The benefit of the group is to breakdown the book each week, discuss book topics, and expand your knowledge of each topic. CANCELLATION/REFUND: Cancellations must be requested by the 5th of the month in order for a 50% refund to be supplied. Any cancellations after the 5th will not be refunded. Avid Reader, Advocate of consistently reading and growing knowledge about Music Therapy field and its surroundings. Muzique is approved by the Certification Board for Music Therapists (CBMT) for 8 Continuing Music Therapy Education credits. Muzique, LLC, AP#P-182 maintains responsibility for program quality and adherence to CBMT policies and criteria. PREVIOUS BOOKS OF THE MONTH! You can now participate in a previous Live Book Club! Just select which book you’re going to read from the drop down box in the form below and we will hook you up! READY TO JOIN THE MUZIQUE THERAPY BOOK CLUB? Please select which book club series you would like to complete! You buy the book and we will send you the worksheets and video links! If you do not have a board cert number, please comment N/A. After submitting this form, you will be charged the one month membership fee! If you requested a previous book club book, you will receive an email shortly where you can download the Book Club worksheets for this month. If you chose to participate in the current book club book, you will receive an email on the first of the month where you can download the Book Club worksheets for this month.